I saw it again on trail yesterday: people with their dogs or a perhaps a friend marching forcefully down the trail, looking to neither side, passing our little party as if they were being pursued by a boogeyman. Perhaps they were–they all looked as if they needed to be somewhere else and RIGHT NOW. Especially in the U.S., we have become so ensnared by the ideas that we must “stay connected” using electronic devices and that our lives are ruled by the clock that we’ve made it nearly impossible to allow for the good things that don’t conform to a schedule or happen at breakneck speed. But I argue that just ambling or puttering around in the outdoors is as important and has it own physical and mental rewards. Yesterday, I saw three species of butterflies emerged from their Winter hibernation giving me reassurance that Spring is indeed coming to the lower mountains. I looked up from the trail and pointed out to my hiking partners a place where completely different microclimates were jammed smack-dab up against each other so they could marvel along with me at how dramatic the differences in plant life were. We stopped to listen to “drumming” woodpeckers and calling jays. And while my scientific mind may give labels to the elements of the experience, it’s my soul that really benefits. Spending time as often as my schedule allows in direct contact with a world that isn’t slave to minute-by-minute time-keeping devices reminds me that human generosity comes when there is grace, and that grace comes with balance. And balance comes by making space in the schedule to reflect, renew, and recharge. Whether you do it in your garden, a neighborhood park, or out on a forest trail, I wish everyone the opportunity to putter. 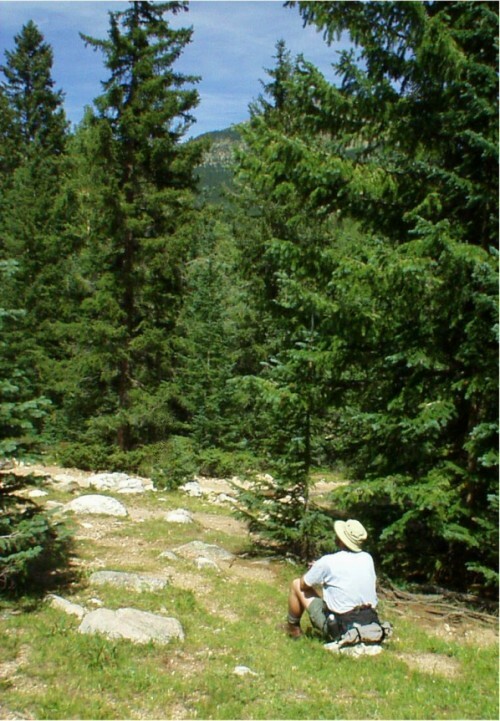 This entry was posted in Human interaction and tagged hike, leisure, outdoor, outdoors, relax, vacation. Bookmark the permalink. Amen, sistah! People travel like that, too. They don’t know how to slow down and watch the butterflies. Amen! My daughter spent an hour yesterday staring into our pond and discovering the sky reflected there and the small fry and polywogs therein. This feeds her wild soul and teaches her how to discover. One of the best gifts of childhood is the ability to do “nothing” and not be chastised. If we could only give that gift to ourselves as adults now and again!